Tripp Lite, a world-leading manufacturer of power protection and connectivity solutions, announced today that CRN®, a brand of The Channel Company, has named Shane Kilfoil, Senior Vice President of Global Sales, to its prestigious list of 2019 Channel Chiefs. The top IT channel leaders included on this list continually strive to drive growth and revenue in their organization through their channel partners. Shane Kilfoil of Tripp Lite has been recognized as a 2019 CRN® Channel Chief. Kilfoil was selected for his leadership of Tripp Lite’s domestic and international sales and sales support organizations. Tripp Lite offers more than 4,000 products to power and connect businesses worldwide and is able to ship inventory quickly, allowing channel partners to meet the needs of their customers. Tripp Lite partners also benefit from pre-sales support, lead qualification, lead referrals, and field sales support. To maximize partners’ unassisted web sales, Tripp Lite provides a wide variety of tools and resources, including enhanced marketing content. 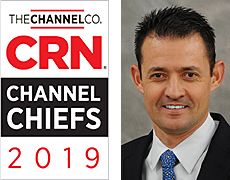 The 2019 CRN Channel Chiefs list, including the 50 Most Influential Channel Chiefs, is featured online at http://www.crn.com/channelchiefs and will appear in the February 2019 issue of CRN.